My sister Liz died on March 19th in Pt. Townsend, WA, where she had been living since about 1969. She lived only some hours after a severe stroke. She was 83. A memorial open house will be held for her at her home in Pt. Townsend on Saturday April 13th, and we will have a ceremony here in Portland when we bury her ashes at Riverview Cemetery on April 23rd. Liz was beloved of many people. Everybody who knew her remembers her laughter and her wonderful sense of humor. She had a huge affection for family members and friends, for animals, and all the pets we’d ever had. And she understood, in a practical way, how the world works. These recent pictures, taken during a visit by Tom and Jamie in February, give an idea of her. Her nieces and nephews and grands- grew in their understanding of the many endearing qualities to be found in all “sorts and conditions” of people, as they interacted with Liz over the years. This brings thanks to everyone who has sent messages of condolence, love, and understanding to us, Joan and Tom, and to our whole family. This exhibit, which will change slightly from month to month, holds pieces of the work of two lifetimes. It is designed to be enjoyed peacefully, sitting down to peruse a book, looking at the underside of a piece of sculpture to see how it was put together, looking at a wall of paintings, watercolors, thinking of your own journals, sketchbooks, treasures. We plan to be there for the opening reception on Sunday, March 10 from 3-5 p.m., and the other Sunday afternoon gatherings on April 14 and May 12. We hope to see you on any of those days. Tom and Joan’s lives have held the role “artist” in very different ways. Tom began drawing and making things when he was very young. His athletic skill and his teaching, in secondary schools and then for 30 years at Portland State University, and his acting, defined his professional life. “Artist” and “poet” are still descriptions he feels fit him ill. He painted that and “Triptych” partly to take his mind off overwork. Objects would gestate sometimes for months in Tom’s studio before they would one day fall into place in his imagination and become part of one of his works. It was not till he retired in the early nineties that what had been called the shop began to be called the studio. He doubled its size, then a few years later doubled it again, felt it legitimate to increase the number of power tools. He joined a co-op gallery, Gallery 114 in what is now known as the Pearl District. In some cases, when a work is owned by someone else or is installed in the Buells’ woods and garden, you will find photographs. Joan has always thought of herself as a “journal keeper,” likely to draw as an accompaniment to writing. It was in her 40’s that she began sketching, first her children, later scenes from home and travel. She recalls thinking of herself as a musician, many of whose friends were “artists,” and beside singing, often with the guitar, she sang in choral groups, traveled to Europe with the Smith College Chamber Singers in 1952. Her ear for music helped her in language acquisition, so that she became fluent in French early in her life, and later added Spanish. Teaching, in preschool, high school, and later in adult education, has pervaded her life. During the 20 years she was involved in hospice work, teaching in another form remained a large part of what she accomplished. So what you see here is an assortment of pieces that are a result of materials coming to hand, a collection of songs as much a creative endeavor as a painting or a piece of clothing. A free-hand cross stitch landscape resulted from a 6,000 mile car trip she and Tom took to Mexico. A skirt made of neckties came out of a bin of silk ties for sale in the late years of the Catlin Gabel Rummage Sale. A cloak made for Tom, after a pattern from a cloak of her own, was made from a blanket found in the Government Camp cabin they bought together with another couple, in the early 60’s. Joan has found it hard to know how to respond to a person saying, when they see her drawing in her journal, “Oh, you’re an artist!” Yes, she makes things. Yes, she’s taken some classes in drawing, box-making, book-making. Quilts, clothing, hat-making came when time or materials or both presented themselves. But the creative process feels as alive to her when she’s making a pie, or helping design a hospice, or sewing a quilt, as it does when she is painting. More of our works can be found at www.tcbuell.com. We spent a glorious Thanksgiving week in Mexico with Hester, Len, Tom and Jamie. We sometimes ate and explored and swam together, and sometimes ventured out on our own. We stayed at Casa Tortuga, the beautiful hacienda on the lagoon in Melaque built by our friend Stephen Bayne, whom we know as Tert. His nickname from our childhood together comes from the fact that he is Stephen Bayne III, but it also inspired a wonderful turtle (tortuga) motif. One early morning, I’d been reading a message about a workshop I’d like to do this winter and spring. My attention was far away for a few minutes, and then I looked up to see this, so brilliant I could only look at it protected by the palm trunk. When I first came out, the morning star was there, reflected in the pool, the lights along the Barra road a cross in the middle. Now, I turn my chair to face inland, away from too much brilliance, and see the glow on wood and greenery that had been at my back. We are delighted not only that nuthatches, woodpeckers, chickadees, juncos and all like these sunflower seeds and suet, but that the squirrels, try as they may, can’t get at them. Our reading club, one of the oldest probably in the country (since 1946 or so), met at a friend’s last week, and I brought the centerpiece, candles and homemade soup. At home, we lighted the candles on our tiny tree just briefly. This quilt is one I pieced during the weeks my father was living his last weeks here in this house. After he died, I quilted it with designs from the Book of Kells, and then gave it to my mother who used it on this bed in the years she stayed on here. It was only when her faithful golden retriever, Sola, died that she finally moved to Portland. We had a dramatic series of legs on our drive home. They were not long, either one, but fraught with hard situations. Coming down from Hansville to the Blacks on Upper Farm Road we were in a fierce windstorm that took twigs and branches off the trees and flung them across the road and made us feel threatened. First a transformer blew out near the top of Bainbridge Island, with that white electrical light and heavy white sparks showering on the road. The second one blew just as we were at it, right as we were coming to the foot of Sportsman’s Road. My reaction was “Jesus!” and ducking my head, finally accelerating through the sparks, not wanting to be separated from our destination if something fell across the road. Several cars had stopped, pulled to the side, heading north. Tom in the wheelchair we luckily had in the back of the car, in an accessible room, canceled our Tumwater motel reservation, and we felt safe at last. Our GPS had heard the Agate Pass bridge was closed, and that prevented us from setting off on the planned route up-island and south through Gorst and Shelton. Thank goodness! We had brought martinis and a sandwich supper so we could eat in our room. Slept soundly from 7 p.m. to 5 a.m. Please click on this link to open our holiday note. This slide show has lots of pictures collected from the past few weeks. Some were taken by Tom and Hester. These are the views from our balcony. We are chuckling over this strange old place: no wifi except in the lobby and then not free, ice is still not here though we called for it half an hour ago. Our bed is headed by a giant cockleshell which we’ve found will light up. But from our balcony here’s what you see. And we’re glad to be safely here. We were walking along our corridor on the way to supper, then found the dining room was closed until 7, so we went back and ate leftovers and hard-boiled eggs from home and a PBJ sandwich. Thanks to all for birthday messages! We had a good day. Soon we head for Melaque, which may appear on maps as San Patricio. The home of our lifelong friend Stephen Bayne III is called Casa Tortuga, and it has a big turtle on the outside wall. Hotter here today. Coming up to lunch a lot of people moiling around in the lobby, which is where I have to go to do wifi. LETHBRIDGE, Alberta — The prediction is it will be snowing by 5. Our holiday up here is for the Canadian Thanksgiving. We drove over across the river this morning and found our way down to the bottoms where I took the panoramic of the river. At the far right of that is the longest train trestle in North America. Milkweed clumps here and there, biggest poplar/cottonwood leaves. The little red ones are on a shrubby thing. I think you’ll all appreciate the fun of this exchange with a long-ago student of Tom’s, who somehow found our email address. He is Willard McCarty, Professor emeritus, Department of Digital Humanities, King’s College London; Adjunct Professor, Western Sydney University; Editor, Interdisciplinary Science Reviews. Might it be that long ago, during the first half of the 1970s, that you taught me the basics of doing research in an MA-level course at Portland State University and later served as one of my examiners for the degree, possibly with Georgia Crampton? If you’re the person I am thinking of, I owe you an enormous debt for the good research habits you insisted I acquire. In fact I acquired them, and have been practising them for more than 40 years. Since I try, whenever memory serves up such an indebtedness, to pay my intellectual debts, I am writing to you to say thank you. Just now, reading a book on the history of experimental science for a paper I am writing for a workshop at Cambridge, you, or that person, came to mind as I carefully noted down the source and page number of a note from that book. Whenever (though seldom it is) I speak of my MA at PSU, I usually remark that your course (if you’re the right one) was the only one I can remember, and the only one worth remembering, though that may be rather unfair to the forgotten. All the best with your art, your writings, your travels. Dear Professor McCarty, This is Tom’s wife writing. It will give Tom such pleasure to read your letter! He was just saying last week, as we were reading the PSU magazine, how proud he was of having taught there, how it continues to serve a population well. Georgia Crampton is still alive, too, and we see her now and then, mostly at memorial services which is a little sad but natural. We get only a glimpse into your life through your words and the information you put at the end of your letter, and we thank you. You must have come on our name somewhere online. You can go to tcbuell.com and to joanstrongbuell.blog, if you haven’t already, and learn more that will reassure you that you have the right person. I am so glad that the chain of associations which led to me writing Tom, then receiving your reply, was triggered this morning by making notes — in a different medium than I used when I learned from Tom how to do it properly back in the 70s, but I do it still with the same sense of scholarly craftsmanship. Twenty years in Canada, at Toronto for the PhD with Northrop Frye, and now, so far, 22 years as a Londoner, separate me from Portland and the Pacific Northwest, but I’m still partially of that place. Your blog and Tom’s page calls all that Pacific Northwestitude to mind. 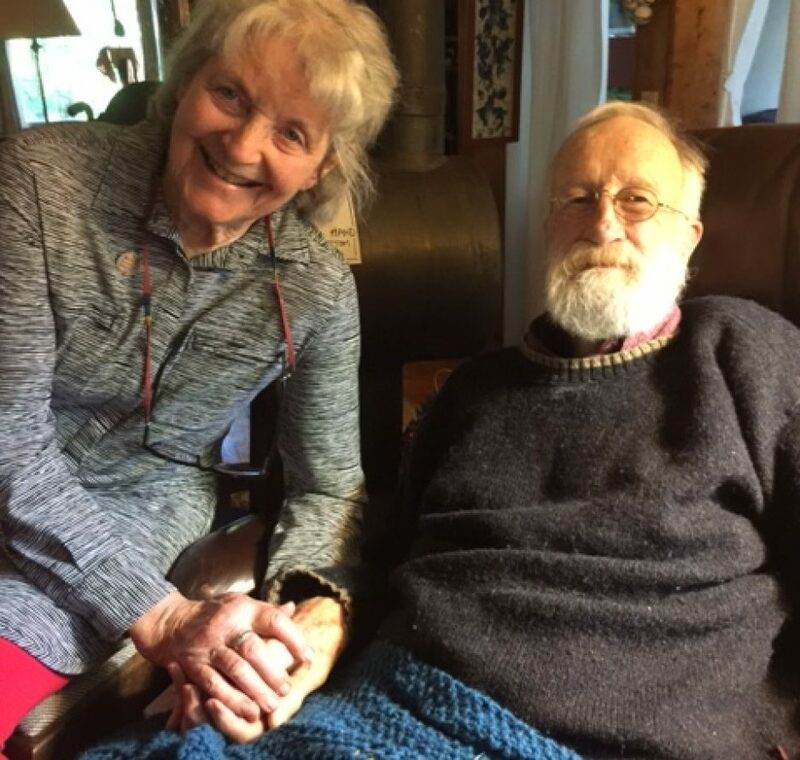 The two of you must not only have done things right (as right as we can) but also sustained the right-doing for an admirably long time — it shows in the photo at https://joanstrongbuell.blog/. Something more for me to emulate. It’s exciting that James Allison has won the Nobel Prize in Medicine. His work in immunotherapy is crucial in proving to the world that the body has ways in itself to stay healthy, and beyond that, to destroy unhealthy tissue when that runs rampant. Learning more from Laney Coulter, who teaches loving kindness hypnosis, about how the subconscious can be influenced by events, and in turn influences events, I feel confirmed in my beginning understanding of how autoimmune disease and psychogenic disabilities function. I probably won’t live long enough to see the widespread marrying of Allison’s immunotherapy with the use of mental imagery, but I am glad to know more about how it works. Now we’re off on an adventure to the Canadian Rockies. From getting our nice red car at 8:10 AM in Whitefish, Montana, along the Flathead River, Logan Pass closed, so around the bottom edge of Glacier Park and up the East side, to our Outpost Motel in Cardston, Alberta. They had a blizzard two days ago, unusually early, and we are very glad we missed it. One very large dead black cow by the roadside. It must have been a whiteout where even she couldn’t be seen. Not often you see such a sharp contrast within an hour, crossing the Continental Divide. We learned that Cardston is the home of George Woolf, one of Seabiscuit’s main jockeys. There’s a statue at the Remington Carriage Museum behind the grocery store.